IIIT Vadodara is situated at Block No.9 of Government Engineering College, Sector-28, Gandhinagar. 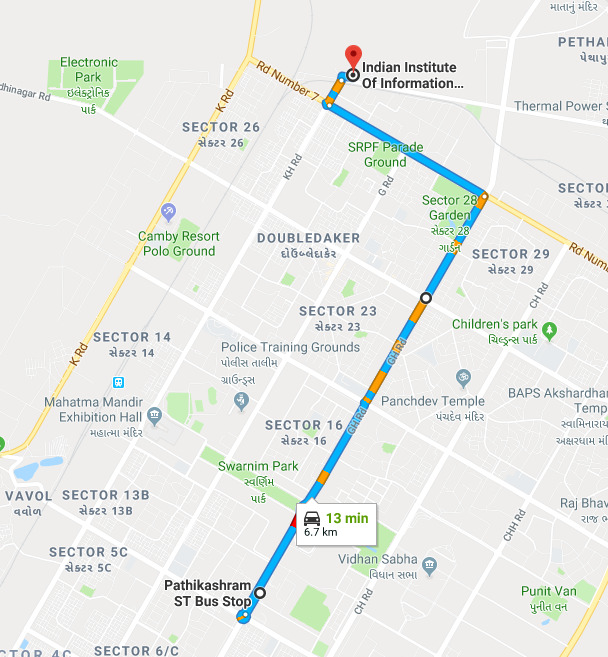 The nearest Bus stop is called the Pathikashram Central Bus stop (6.5 Kms), Nearest major Railway station is at Ahmedabad (32 Kms), and the Airport is the Sardar Vallabhbhai Patel International Airport, Ahmedabad (24 Kms). 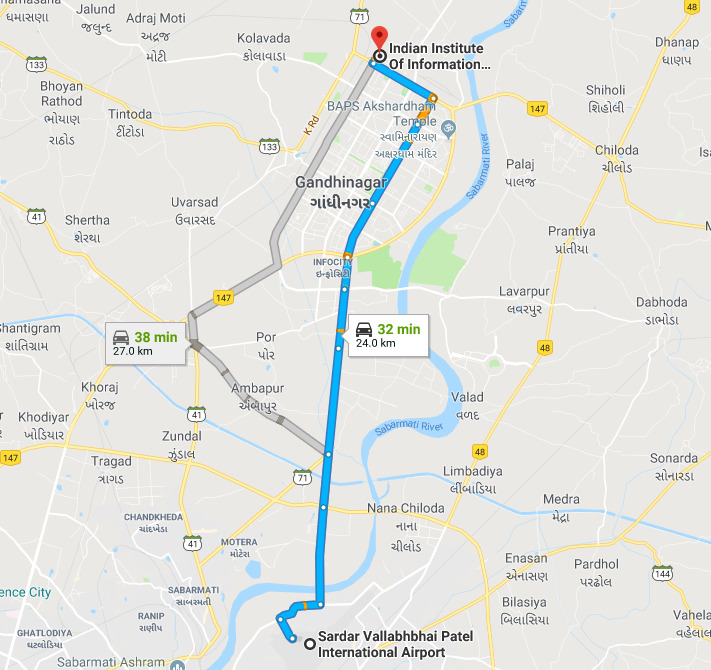 The nearest International Airport is Sardar Vallabhbhai Patel International Airport, Ahmedabad, roughly 30 mins drive from Gandhinagar. Sardar Vallabhbhai Patel International Airport is well connected to all the major cities like Delhi, Hyderabad, Jaipur, Kochi, Kolkata, Lucknow, Mumbai,Nagpur and Pune via all major airlines. The nearest major Railway Station is Ahmedabad Railway Station at Kalupur, which is connected to the major cities of India and is around 30 Kms from the institute. Other 2 railway stations; called the Maninagar and Sabarmati railway station are also there in Ahmedabad including one at Gandhinagar; however the main railway station is the one situated at Kalupur. It is linked with most of the major cities of India. 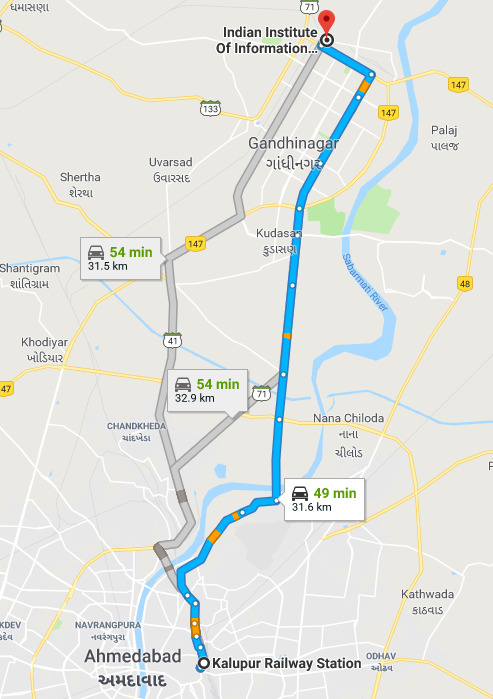 Gandhinagar is 26 Kms from Ahmedabad, 134 Kms from Vadodara, 150 Kms from Godhra, 289 Kms from Surat, 240 Kms from Rajkot and 553 Kms from Mumbai. Students/ Parents can book cabs like Ola, Uber. Other conventional vehicle are also available like autos and taxis with negotiable rates.